A powerful home air conditioner is going to be your best friend when temperatures soar. 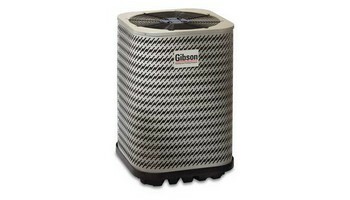 Hard-working Gibson home air conditioners offer peak performance at a price suited for any budget and need. Not only that, but each Gibson air conditioner is durable and designed to last for years and years. Each Gibson home air conditioner is solidly built with a durable steel jacket that can protect the interior components from unnecessary wear and tear. Not to mention, all units are factory-checked 100% before being shipped and installed in your home – ensuring best practices were used during manufacturing.Home air conditioners can come in two different setups – the split system and the packaged system. Split-system air conditioners contain an indoor component and an outdoor condensing unit. Your indoor component can include either an air handler or furnace, depending on your particular home air conditioning system needs. Both the indoor and outdoor components work together in order to provide lasting home comfort and powerful cooling capabilities, For highly-efficient performance and better indoor temperature control, choose this home air conditioner that delivers up to 16 SEER cooling power. The outdoor section features single-stage cooling technology and combines with our variable-speed indoor section to provide the best in cooling comfort. The variable-speed fan blower in your air handler or furnace can better mix the air in your home and provide greater levels of indoor air quality and humidity control. This unit also includes outdoor Anteater MC®Micro-Channel coils for greater corrosion resistance – helping reduce instances of coil leaks. For a more budget-friendly system that still has the great air-mixing capabilities offered by a variable-speed motor in the indoor component, this 14-SEER home air conditioner can be the system for your home. This unit is a great option if you are looking for an air conditioner that can pair with a variable-speed indoor unit that offers premium indoor home comfort levels, but must keep a budget in mind.This hardworking, economical home air conditioner is ideal for homeowners that want powerful air conditioning at a great value. An old home air conditioner from the past may only be rated at 10 SEER – significantly lower than even minimum efficiency units sold today. This means that a standard-efficiency air conditioner produced today could still be a great money-saving tool for your home.When a manufacturer is confident in the quality of their HVAC products, it is reflected in the amount of protection offered by the warranty.